On the coast of the Isefjord can be found a number of plants from Eastern or Southeastern Europe. These are plants that typical prefer warm, hot summers and cold winters. Anthericum ramosum in the right picture is one of these. 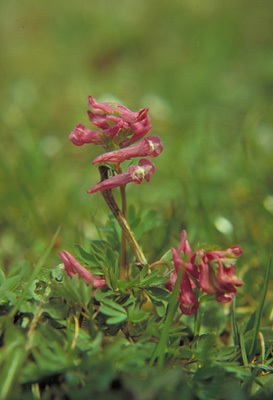 This species has its main distribution in Europe in the steppe-region in the southeastern parts but has some scattered sites longer north. It is a protected species in Denmark together with its relative Anthericum liliago. 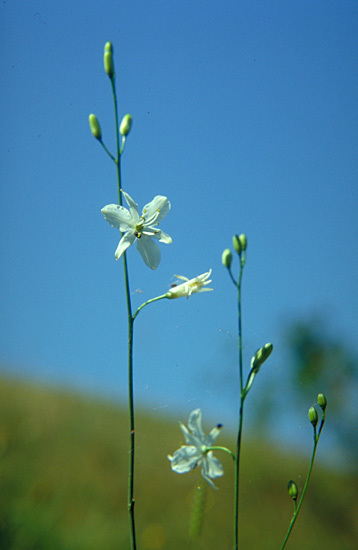 Anthericum ramosum can only be found in a few places in Northeast Seeland and has the largest danish population i Danmark on the slopes of the river valley of Ejby. Other species with an europeaen distribution from the river valley of Ejby is Corydalis pumila (right buttom), Pulsatilla pratensis, Gagea pratensis, Potentilla heptaphylla, Scabiosa columbaria, Phleum phleoides, Geranium sanguineum, Thalictrum minus, Malva alcea, Avena pratensis, Artemisia campestris, Vicia tenuifolia and Vincetoxicum hirundinaria. 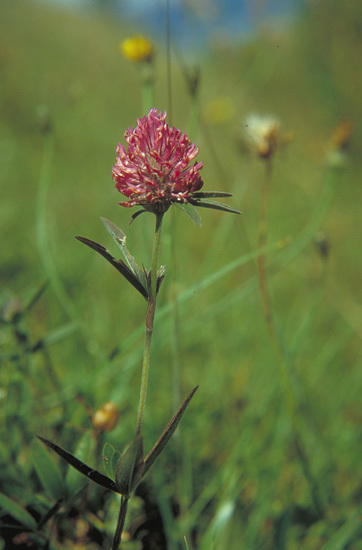 Trifolium alpestre in the left picture has an eastern distribution in Europe. In Denmark it is confined to Seeland, where it is found in several places especially in the north. Back to The coasts of the Isefjord.